Pouch Dimensions: 2.87" x 4.12"
I sought after a clip on Badge for the reason that pins sometimes tear the clothes. Because it is clear I can put a name tag both ways so even if the badge flips you can still read the name. The only complaint is that I needed 60 badges and they came in lots of 50...so I now have enough for the next conference too, I guess it's not all bad. Oh yes, they were not in stock at my local store, but I ordered them on line and they arrived in time for my first meeting that same night. We will be using this product for a long time, so it's too early to judge its longevity, but initially it seems like a good product at a good price. Welcome to MyBinding.com. These are the Self Adhesive ID Tag Pouches from Fellowes. 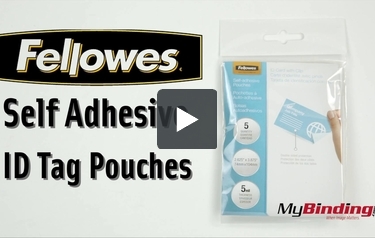 Quickly make long lasting ID Badges with Fellowes laminating pouches. Simply align your ID document inside the pouch, remove the small adhesive strip to set it, and remove the rest to seal it all up. The punch is oriented at the top and works perfectly with the included vinyl loop and bulldog clips. Secure right to clothing without worry of damage. For more videos and all your binding needs, go to MyBinding.com.